I made some assumptions about the Victoria Clipper. 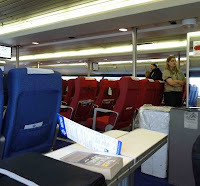 I assumed it was like a ferry with vinyl seats, some at tables, some in rows. The snack bar would have a cafeteria-selection of food and an eating area. I thought there would be outside decks to roam. We arrived a little after 7 a.m. for an 8 a.m. departure. The curbside baggage check-in should have been the first clue that this was not going to be a ferry experience. When we checked-in we were given a boarding group number. This was the second clue. Funneled down a hallway through passport check, we let out into a long, narrow room where we were packed in like cattle. We were in group four, the last group. We stood near the door waiting for our number to be called. The Clipper is a catamaran with two levels. Filing onto the main level, we saw on both sides, seats facing tables, all filled, and in the middle, rows of seats, many also filled. It looked and felt like the interior of a Boeing 747. The seats were airplane seats. The heads were airplane heads. AAAAH! I require lots of preparation to fly. I need certain things and have to do mental relaxation exercises beforehand. I was not ready for this. We found seats in the middle section, three rows from the bow of the boat.